Water Bottle Gift Set $39.95 - includes a 26-ounce Stainless Steel water bottle, Wenger gift box, D-Ring attachment, the embroidered Walking Man Shoulder Bag (yes, the water bottle fits inside!, two artisan holiday gift cards with blank interior, and a holiday gift bag. Walking Man Cap and Shoulder Bag Gift Set (Navy cap) $49.95 - includes the Walking Man Cap (Navy/Tan colors), Walking Man Shoulder Bag (Black with silver embroidery), two artisan gift cards, and a holiday gift bag. 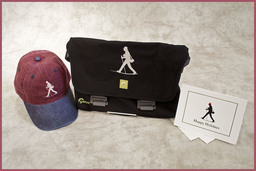 Walking Man Cap and Shoulder Bag Gift Set (Port cap) $49.95 - includes the Walking Man Cap (Port/Navy colors), Walking Man Shoulder Bag (Black with silver embroidery), two artisan gift cards, and a holiday gift bag. Orders can be shipped to any United States postal address via USPS Priority Mail. Typical delivery time is 2-5 days from when your order is placed. Each package is ready to give. All you have to do is sign the card.